Real Life Assignments takes you behind the scenes with professional outdoor photographer Dave Willis on assignment. Learn new photography hints, tips and tricks and see what really goes into photo-shoots. You won't believe this but the climber in this photo, hanging from from the roof by ice axes is called Paddy Cave! Honestly. Anyway, Paddy was telling me about this whole new thing in climbing - "sport mixed" or "dry tooling". The idea came about as a progression from climbing hard mixed winter routes which rely on climbing sections of steep rock between bands of ice - using the ice tools - and climbers training off-season for winter routes on artificial climbing walls with ice tools. 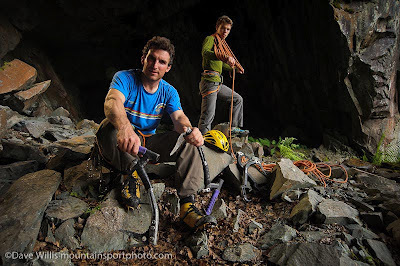 Supposing you used disused quarries instead of climbing walls, and manufactured some really hard routes by drilling or chipping some axe placements, bolting the wall for the placement of protection ( what climbers call running belays or just "runners") and seeing just how extreme you can get with dry tooling? Et Voila! This is the result. 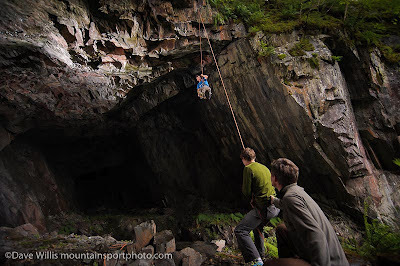 This cave was made as part of slate quarrying activities at Hodge Close, near Coniston in the English Lake District. Hodge Close is already well known as a world-class, slate rock climbing venue and also as a dive venue for scuba divers in it's flooded quarry pool which is over 25 meters deep. Being a quarry, no-one is going to worry about chipping and drilling holes - obviously. As a photographer of outdoor "extreme" sports, I would definitely be wanting to shoot this, all the more so because of my background of 30 years in rock climbing and mountaineering. I arranged to meet up with Paddy, who has been responsible for creating most of these new routes (including the one we photographed) and his pal, Alex who would be belaying. Normally at this point I would be complaining about the disastrous summer weather we are having - with endless rain and grey skies - but hey, ho, this venue is under cover - it's a cave! Excellent. Logistically, shooting this sport is both very easy and very hard. Access is easy in terms of getting close, you can park about 100 meters away, but then to get into the quarry you have to down-climb a vertical rock wall (over-hanging actually) with aid of an in-situ bit of old rope (!) 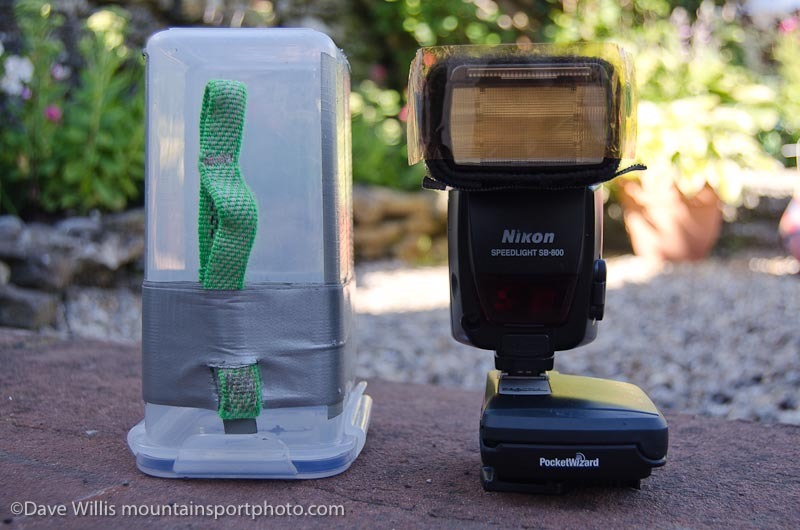 whilst carrying 15 kilos of camera kit, lighting kit and abseiling kit. Don't try this if your personal climbing skills are iffy - it could end badly. 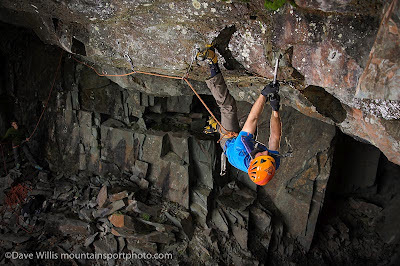 Then you have to make your way to the rim of the cave (vertical wet grass and mud) and then rig an abseil line to access the line of climbing bolts to shoot the route. Once you have established yourself on the route, hanging in a harness, with your camera kit hanging from your body in various bags and with a 25 meter drop under your toes, you are ready to shoot. But you better make sure you rigged all your lighting gear in the right place first, 'cos it's a lot of work to get back to your flash guns and re-direct them! Maybe you should have brought an assistant? And you are going to need those speedlights because it's a cave remember? I think by now you get the idea that this takes some planning. Let's take a look at the gear I packed for this shoot. First the lighting. I used three Nikon speedlights in these photos. An SB800, an SB600 and an SB28. All three were triggered using Pocket Wizard Flex TT5 transceivers from a PW Mini TT1 on the camera with AC3 zone controller to adjust the power output remotely. The SB28's power output can't be controlled by the AC3 because it's not a "digital" flash, but once the power setting is dialled into the flash you can still fire it remotely using the Mini TT1. Knowing that I wouldn't be able to alter it's power output once I was in position on the rope, I chose to position it on a lightstand, at the entrance of the cave, pointing up at the rim. You can see the effect in this shot above. The SB28 was zoomed to 80mm with a snoot attached, with the idea of using it's power to pick out the climber. I'd use whatever f stop was required to expose for the SB28 at half power and dial the other two flashes up or down as required. I really have to swap that flash out for another SB800 because it's getting to be a pain not having full remote control. The other two guns would be fully remote so...The SB600 went into a food container as pictured - I have a bunch of these - to keep it protected. I was going to take this on the rope with me and hang it from someplace to act as a fill light for the climber. The SB800 was put on a stand at the back of the cave and pushed through a shoot-through umbrella to act as a large rim-light or "kicker". I was hoping/expecting Paddy to hide that flash when he climbed towards me and get a nice edge light around him to separate him from the rock and give me a "look" that I like. So, with all that in place, I picked up the D700 and headed for the abseil rope. Once in position, first thing was to get the ambient looking good. Being a cave, (and a rainy day) there wasn't a right lot of ambient to deal with, but a dialled the shutter speed down from 250th to 125th to see what happened. Hmmm, not a lot. So I upped the ISO to 800. OK that looked fine, nice touch of ambient light, not too strong so the flash can do it's stuff. Then I shot a couple of test shots to get the flash power dialled in on the remotes and figure out the right f stop to go with SB28's output. Turned out to be f5.6. The SB600 fill flash in the tupperware worked fine just hanging off the top lower-off bolt just off to my right side, as long as I dialled the power right down to about 1/28th power. With everything working and looking good, it was time for Paddy to perform. Which he did! To describe sport mixed climbing as "physical" would be an under statement of very large proportions. 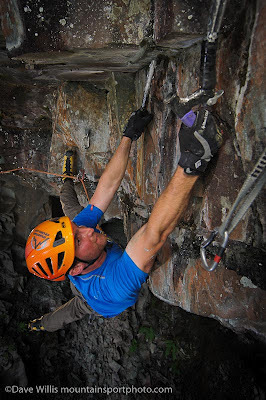 It's muscle-screamingly tough to climb at this extreme overhanging angle, carefully placing and weighting crampon points and gripping axe handles whilst trying to clip the protection and still look good for the camera. Particularly when the photographer casually asks if you wouldn't mind just doing that move again but this time a bit to left to hide the flash gun! After half an hour of this we were all spent. Worth it though. If I'm going to go to the trouble of hauling this gear, getting on a rope and dangling over a cliff, I'm going to do it right and I'm going to light it! This is the first go at shooting dry tooling and I think there's a lot of potential here so we'll be back to try some more and see if we can get even more radical.